The pavilion will provide all-weather indoor and outdoor facilities for the local community for events including the annual Carols in the Park, as well as concerts, festivals, community and private events. The pavilion will provide a much needed cultural asset for Ocean Grove. The pavilion facility is perfect for local schools and community groups. The Pavilion includes a meeting room for up to 80 people, fully equipped kitchen and an outdoor decking area. 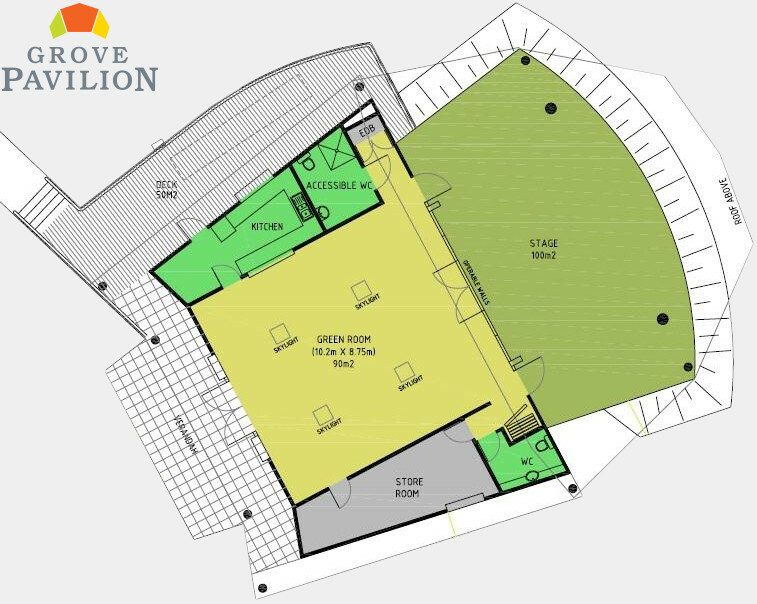 Grove Pavilion features: Green Room seats up to 100, Stage 15 metres wide plus a kitchen and alfresco deck. The Grove Pavilion was a long time in the planning, originally the concept was developed by the late Neil Wallace and construction commenced in 2014 – completed and opened in April 2015. The construction of the Pavilion was funded via the State Government, City of Greater Geelong Council & local fundraising via the Ocean Grove Connected Community. The Ocean Grove Park committee manage and maintain the park and manage the Pavilion. All of the committee members are volunteers from the local community. Anyone can become a member of the Ocean Grove Park and we are always looking for people to get involved, so if you would like to be involved please contact the Park Committee on 0413 978 058 or email president@oceangrovepark.org.au.